The ministry of altar server is an import role in every Catholic mass. Some duties of the servers are to process with the cross, and candles, hold books, arrange the sacred vessels on the altar, and assists the priest in various ways during the liturgy of the mass. This ministry is open to both boys and girls from the Saint Dominic Savio community. As a server you will take on the responsibilities in support of the priest and other ministers, and the total assembly itself during the mass. We encourage the child who joins this ministry to treat it as a calling from God. Applications are accepted at any time, but NEW server training starts in September and runs through March. Click here for the current meeting and training schedule. New applicants will begin to serve at mass while they continue their training. 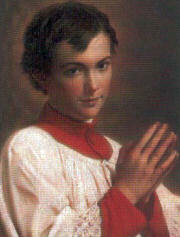 Refer to this Ministry link for a complete list of requirements for joining the Altar Server Ministry.